New members, this is a 2-step process. A volunteer needs to approve each membership. This may take up to 48 hours. Please return to this page after your application has been approved! Description: Current student at one of Harvard University's schools. Non-voting membership. Dues Waived. Description: Current student at one of Harvard University's schools. Non-voting membership. Dues waived. Includes a one-year subscription to The Gay and Lesbian Review. Description: Recent graduates within two years of receiving their degree. Voting membership. Dues waived. Description: Contributing Members help support the HGSC financially. Voting membership. Description: Contributing Members help support the HGSC financially. Voting membership. Includes a one-year subscription to The Gay & Lesbian Review. Description: Free, non-voting membership. Includes a 1-year subscription to The Gay & Lesbian Review. 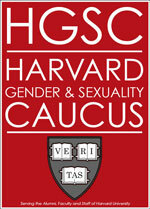 Description: Support HGSC with a larger contribution and get 3 years of voting membership. Description: Contributing Members help support the HGSC financially. Voting membership. Includes a one-year subscription to The Gay & Lesbian Review plus $10 shipping to Canada and Mexico. Description: Free, non-voting membership. Includes a 2-year subscription to The Gay & Lesbian Review.